I’ve been struggling to write this blog, because nobody likes a braggart, and I didn’t exactly know how to word it without sounding like one. So I’ll do my best. I’m really excited, though! 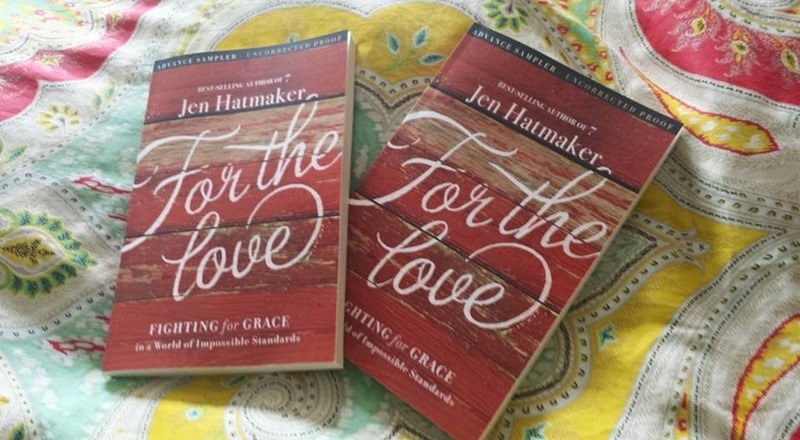 Last month, Jen Hatmaker announced via Facebook that she was going to allow her readers the opportunity to be a part of the Launch Team for her new book For The Love. They were going to accept 500 people, and it was first come, first served. Of course I had a minute to sit down and apply about seven hours after she originally posted, so I almost didn’t apply at all, but decided to “just in case.” The application consisted of submitting all of our social media handles, blog web address, and a short statement about why we wanted to participate in the launch. I honestly can’t remember what I wrote, but I do know that it was about two sentences. A few days later, I got an email saying that 5,000 people had applied for a spot on the Launch Team, and I was one of the 500 chosen. I guess they didn’t end up doing first come first served, but clearly it was an error or a miracle that I was picked. Either way, here I am! We were given a PDF copy of the uncorrected manuscript to read in our first Launch Team email, so I read the entire book in one day. I kept meaning to stop and savor, but For The Love is so hilarious, meaningful, and convicting that I just continued reading. I received my hard copy of the book on Tuesday, and couldn’t wait to start reading it on real paper. My highlighter has been working overtime capturing quotes, lessons I’ve learned, and things I definitely need to apply to my own life. Hands down, the best part of being selected for the launch team isn’t getting to read For the Love early, or getting the chance to write a review that will be included in the book. It’s the Launch Team Facebook group. You guys, there is a community there that I haven’t experienced before. People are sharing their struggles and celebrations. There is authenticity, transparency, and love over there. It’s its own little tribe, and I feel extremely blessed to be a part of it. Because I’m on the Launch Team, part of my job is to help you realize that you should buy For The Love (preorder is on now! ), but it also means that I get to share pieces of the book with you, so you can see why you should read it! So from this Friday, April 3, until the book launch in August, I will be doing a series called “For The Love Friday.” I’ll share a quote from the book, and what I took away as a reader. My thoughts won’t give away the book, it’s just my way of making text-to-self connections (shout out, to my elementary teachers!). So, I would love it if you would follow me through this journey. And I hope you’ll be willing to share what you take away from the quotes in the comments section. I love discussion and hearing others’ perspectives!